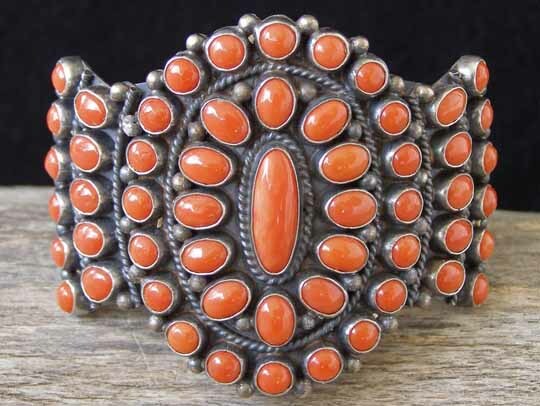 Anthony Skeets Mediterranean Red Coral Cluster Bracelet size 6 3/8"
Anthony Skeets is a prolific Navajo silversmith who works in the Traditional Revival style of smithing. He is best known for the cluster bracelets he makes, but he makes a whole range of jewelry in traditional style from earrings to concha belts. This gorgeous cluster bracelet features a large oval central cluster set with a combination of ovals and rounds of natural Mediterranean red coral arrayed around a center oval of perfectly matched coral. Fans set with ovals and rounds flank the center cluster. The cuff consists of five heavy-gauge lengths of triangle wire, fused at the terminals and spread apart to form a wide cuff in front as a foundation for the coral clusters. This is a beautiful study in symmetery set with the finest blood red coral. You'll find this design particularly comfortable on the wrist. Hallmarked "AS" and stamped "Sterling" inside. Dimensions of center cluster: 2 1/8" x 1 7/8"
Width of cuff at terminals: 3/4"